Have you ever sat at one of those moments in your life when the clouds hang overhead and you’re not really sure which way is up? You long for a breeze to blow that mist away and give you a new view of that snow-capped mountain. Or, maybe you imagine that you’ll have a better view of that rocky beach at your feet – the stones underfoot will glow in brilliant colors the moment the light strikes. But sometimes the grey is what you need before you find your way. We have experienced uncharacteristically warm weather in Antarctica. 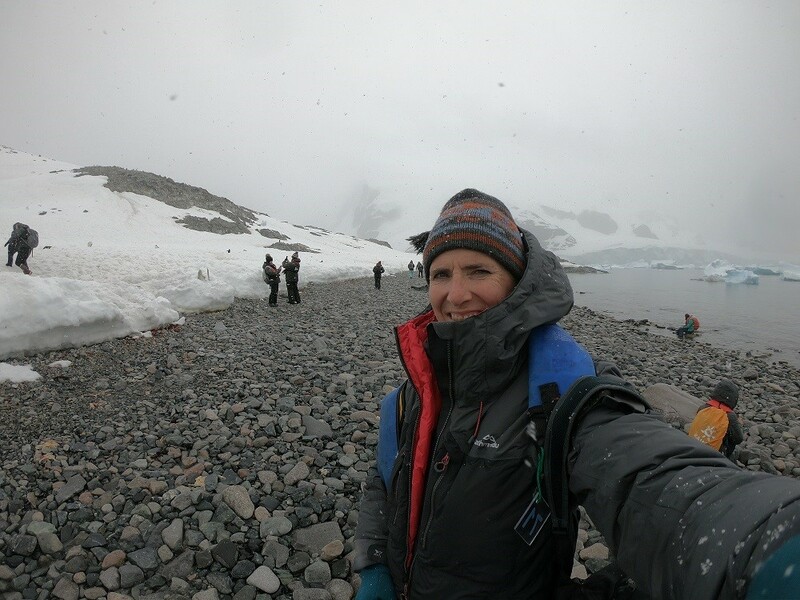 On our second landfall at Paulet Island, on the edge of the Weddell Sea, the temperature climbed to a sweltering 9 degrees Celsius (48 degrees Fahrenheit) on the beach. As a climate scientist, I know better than to attribute a single warm day to global warming. But it’s a fact that the likelihood of these types of warm days increases with rising global temperature, so our chances of making landfall on such a warm day along the northern reaches of the Antarctic Peninsula are not low. Things had changed, however, by the time we reached our second penguin colony at Cuverville Island. A fog moved in on us and engulfed the ship. It rolled over the shoreline and obscured our view of the mountains. Soon, there were big flakes of snow settling on our hoods and sleeves as we boarded the zodiac for our landing. When the temperature hovers around or just above freezing, the snowflakes stick together in big clumps and fall like feathers. We zipped across glassy blue-grey waters, skirted around icebergs sculpted by wind and tide. We could hear the shoreline before we could see it, and then, shortly afterward, along a snowy-covered slope above, we spotted Gentoo penguins scooting their way down a path in the snow toward the beach. I sat on the beach for a while watching the penguins go about their business. Icebergs and cream-coated mountain peaks came in and out of focus as the mist shifted. As the temperature dropped further, the snowflakes became more distinct – intricate six-pointed stars, each with a different pattern. We call them ‘stellar dendrites.’ You will only see these if you pay attention to what appears from a dull grey sky. We are nearing the half-way point in the voyage, heading towards the end of our 12-month leadership training program, and one of the things we talk about is moving through the confusion, through the mist, before things become clear. 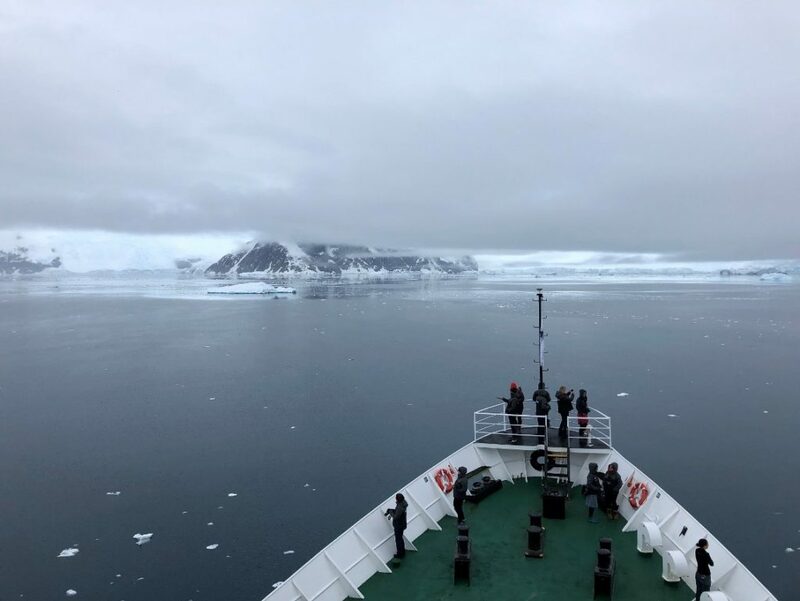 As our ship moves southward along the Antarctic Peninsula, the mist comes along the water and in our minds as we move to a new state of being. Similarly, the path toward a more sustainable world is not always so clear. Sometimes we just have to wait a moment to see what emerges from the fog. Cindy Shellito is a professor of meteorology and climate science at the University of Northern Colorado. 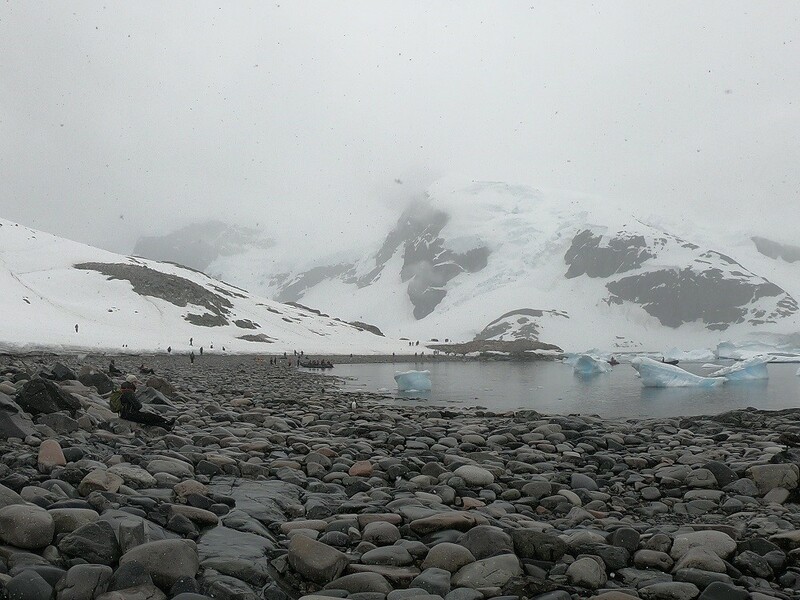 Gentoo penguins and people sit in the mist on the landing site at Cuverville Island. The Ushuaia carries Homeward Bound across smooth Antarctic waters toward Cuverville Island.